Since 1998, I’ve built strong relationships between Casinomeister and fellow webmasters. Here is a brief list of some portals that have, in my opinion, redeeming qualities and highly useful information within their pages. I know these webmasters personally, have met them numerous times, and they all have the same approach to this industry as Casinomeister: players first and ethical marketing practices. Among other things, “AZOC” provides a comprehensive listing of reputable online casinos, organized by software provider. These listings include a myriad of helpful information including: cashout time, cashout reverse time, weekend cashouts, manual flushing, bonus types, etc.Put together by the scripting wizard Simmo! (one of our most experienced players and also a Casinomeister forum moderator), it’s an excellent resource whether you are a player or an affiliate looking for guidance.Also on the AZOC site are several search facilities such as the regularly updated casino games locator and the ability to search for casinos that match specific criteria such as short cashout/reverse times, safe licensing jurisdictions, popular casino software and more. There is also a comprehensive industry news section and a ‘101’ area to help newbies navigate the pitfalls of gambling online.AZOC is a fantastic site with a ton of useful info for those who dig!Dig it. 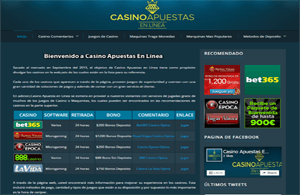 Launched at the end of 2015, CasinoApuestasEnLinea.com caters for the Latin American market, currently focussing on Mexico, Argentina and Chile. With plans to produce a Portuguese version for the Brazilian market.Set up by Graham Campbell ( former founding shareholder and Director of multiple award winning 32Red ) and Dave Sawyer ( aka CasinoMeister Moderator Webzcas), Casino Apuestas en Linea provides advice and relevant information for the Latin American sector. Featuring a geo targeting system, the site opens in the language appropriate to the visitor’s location, also providing visitors to switch language delivery.All casinos which are featured on the site are assessed for providing acceptable player support in the relevant language. In addition the site also features a number of free play casino games for visitors to enjoy, which is added to frequently. 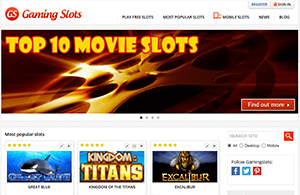 The slots portal Gamingslots was launched in 2012 to help slots enthusiasts make sense of the thousands of slot games available from a multitude of suppliers. 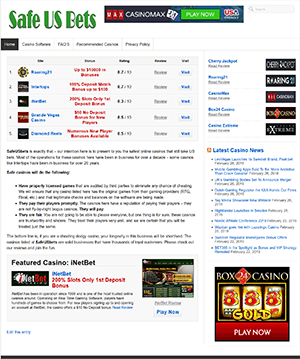 Gamingslots provides comprehensive reviews, news, opinion articles and promotions all related to slots.Where possible Gamingslots provides free play slots of games reviewed at the site, as well as videos that demonstrate how features are activated in each slot.Gamingslots is available on variety of devices, including desktop, tablet and mobile. Helping you navigate to the information that is most relevant to you. Advanced auto-detect search and smart filtering tools allow you to find the slots you are looking for much quicker.Casinomeister moderator conker is a contributor to Gamingslots and is part of a small team of slot-o-holics that constantly work on improving the website. Well, what can I say? This is the Disneyland of online gamblers. GoneGambling has a unique and quirky community that just wants to have fun. What makes GoneGambling so special is that there are loads of games that members can play where they can win GG points. These points can be gifted to other members or traded in for bonus points at sponsoring casinos. Gone Gambling has been an icon for gamblers since 1998. You should give them a try. 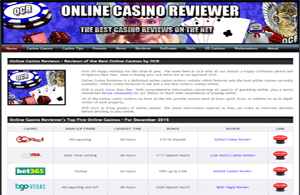 Established in 2004 and produced by Bath Rock Media and Dave Sawyer, this website is chock full of well written and honest reviews of many upstanding online casinos. 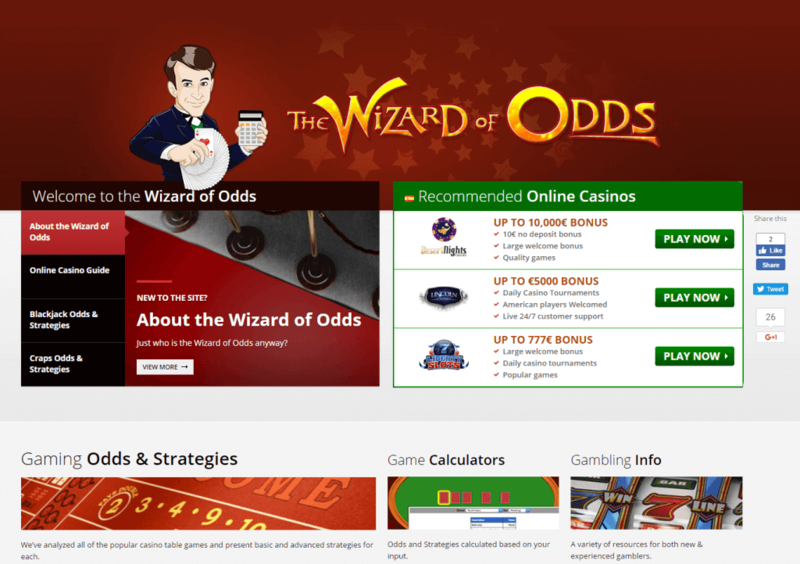 OCR also features 100 + free play slot games for visitors to site to try out. These games are from some of the leading casino developers in the industry, including the likes of IGT, Microgaming, WMS and Novomatic.Without a doubt, Dave Sawyer (aka Webzcas in our forum amongst others) is one of the most dedicated webmasters in the business. A technical wizard, he also assists in the administration of Casinomeister and GoneGambling. SafeUSbets is a relatively new portal that presents mostly RTG, Rival, Betsoft, and WGS casinos to its visitors. The majority of the casinos listed here have been in operation for years – some up to two decades. Not only do they list recommended RTG casinos, they have some of the best bonuses one can find online. Run by some seasoned affiliates in the States, this portal looks promising with its recommendations and online casino news. SlotsUp’s team is working day by day to create something completely new in the gambling niche. Starting from the website itself up to the last bit of information provided on the site. So, here are a few key points about the SlotsUp.com:R. Doroshenko gave it birth in 2015 after he left the Slotozilla project to start with something new and better from scratch. The site itself is built using HTML5 & CSS3 technologies. All graphic elements are created in SVG format (vector graphics) which weight few times less than raster ones (png, jpg, gif, etc.) and load much faster. The devil is in the details. 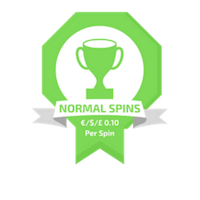 Main goal of the project is to collect the most up-to-dated database of all online slots ever created. 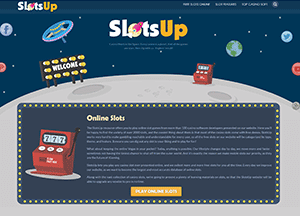 Currently SlotsUp’s collection counts 2626 free slot games and updates daily. What’s even more important, among the well-known casino software developers like NetEnt, Microgaming, IGT, Novomatic or Aristocrat you can find the new players on the iGaming industry arena. Each game on site is provided with the full information covering tech specs of the online slot machine as well as all its features. There are two options to try out the game, watch the video review on SlotsUp’s YouTube channel or play free demo game available for each slot. Some of you may remember the Casinomeister/Slotjunkies competitions pre-UIGEA. Since that fateful day, Meister Moderator ‘Simmo!’ has evolved Slotjunkies into a detailed video slots database containing information and demos of hundreds of online slot games.Every slot featured on the site has a unique video and every video demonstrates the bonus feature. Accompanying each game are details of the slot itself (often with the expected RTP too!) and a list of reputable online casinos that have it available to play.Among the slots on offer at Slotjunkies are the latest online offerings from well-known slot manufacturers like IGT, WMS and Novomatic along with info on the new Aristocrat slots that are coming online. Online-only video slots from Playtech, Microgaming and RTG are also covered.Slotjunkies is an awesome site for slot players and is a popular resource for many Meister members. ThePOGG or the Players Online Gambling Guide, has been around for a number of years, and it has some of the highest standards that you will find on the Internet when it comes to an online gambling portal. 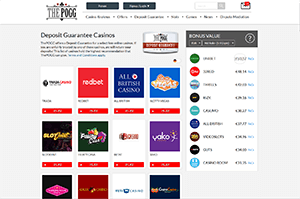 ThePogg lists casinos that have truly been vetted, and even guarantees that you will be treated fairly at a number of them via their “Deposit Guarantee” program. The casinos that display this seal are held accountable to treat you fairly. If you have an issue that leads to an unjustified seizure of funds, ThePOGG.com will guarantee that you’ll receive your deposit back from their own wallet – that is, if the casino doesn’t do the right thing. ThePogg offers dispute services much like Casinomeister, and they have a lot of helpful information on their website which includes their reviews: recommended, not recommended, and rogue casinos. ThePogg is an excellent resource for online gamblers – and their approach and philosophy is one that other webmasters should emulate. Lead by example – that’s what thePOGG does. Michael Shackleford is “The Wizard of Odds”. He is a professional actuary who has made a career of analyzing casino games. Many of the most popular slots online have been tested by Michael – he runs the numbers for many game developers and has had a hand at designing the back end of these. He is currently an Adjunct Professor of Casino Math at the University of Nevada, Las Vegas, a former contributing editor to Casino Player magazine, and the author of the book Gambling 102, recently published by Huntington Press. The Wizard’s landmark research into the actual returns of slot machines on the Las Vegas strip garnered international attention in 2002, and he has appeared numerous times on national television as a recognized expert on gambling strategy.I’ve personally known Michael for years and have used his website countless times doing research and finding answers to many questions of probability and casino math. This website needs to be bookmarked by anyone who gambles online.